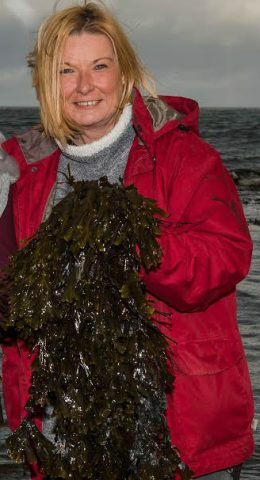 Palmaria Palmata (commonly known as Dulse, or Dillisk) has been harvested for generations here in Northern Ireland. This Irish seaweed was originally harvested by fishermen to supplement their income when fishing was slack. The earliest record of dulse is of St Columba’s monks harvesting the sea vegetable some 1,400 years ago in Ireland, and it is there that has shown the greatest eagerness towards the consumption of dulse. In fact, the common name ‘dulse’ originates from the Irish, and has come to be in widespread use even in countries where English is not used. Dulse is frequently used in Northern Ireland, Iceland and North East America as both a food and a medicine. Dulse is a red seaweed that possesses a mildly spicy, salted flavour, and is traditionally bought in a dehydrated form. It can be eaten in this form or soaked in water and added to soups and salads, stir fries, and other dishes. When rehydrated, it is slightly chewy. Other culinary uses for dulse involve grinding the dried seaweed into a powder to be utilized as a garnish, or fried into crispy, tasty chips, is also used to compliment seafood, vegetables, grain dishes, and can even be baked in breads and muffins. Because the sea vegetable is so versatile, it is an excellent way to ensure you get a good source of many essential vitamins and nutrients in your daily meals, and it is especially good for vegetarians as a way to receive a good dose of non-animal protein. As for its nutritional content, dulse is extremely high in vitamins B6 and B12, as well as iron, potassium and fluoride. Unlike other seaweeds, it is relatively low in sodium. Dulse also contains a large shopping list of other vitamins and nutrients, including vitamins C, E, and A, magnesium, calcium, dietary fibre and protein. Additionally, dulse is a natural source of iodine, essential for thyroid gland health and thyroid hormone secretion. Rich with trace minerals from sea elements, dulse can quickly become a welcome accompaniment or garnish to many meals, or can simply be enjoyed as healthy snack. Seaweed bath are nature’s perfect body balancer, and they’re an excellent way to take in iodine therapy. Seaweeds purify and balance the ocean; they can do the same for your body. Noticeable rejuvenating effects occur when toxics are released from your tissues. A hot seaweed bath is like a wet steam sauna only better because the sea greens balance body chemistry instead of dehydrating it. The electrolytic magnetic action of the seaweed releases excess body fluids from congested cells and dissolves fatty wastes through the skin replacing them with depleted minerals particularly potassium and iodine. And because iodine boost thyroid activity food fuel is used before they can turn into fatty deposits. Vitamin K in seaweeds aids adrenal regulation meaning a seaweed bath can help maintain hormone balance for a more youthful body. helps your skin elasticity, and appearance of your skin tone. Run hot water over the seaweed in the bath, filling it to the point that you will be covered once in the bath. The seaweed will expand and the water will turn a rich brown as the seaweed releases the minerals. Forty minutes is usually long enough to balance the acid/alkaline system, encourage liver activity and fat metabolism. Also, your skin tone, skin colour, and circulatory strength are almost immediately noticeable from the iodine and potassium absorption. Images Copyright Tourism NI | Built by Kobault.